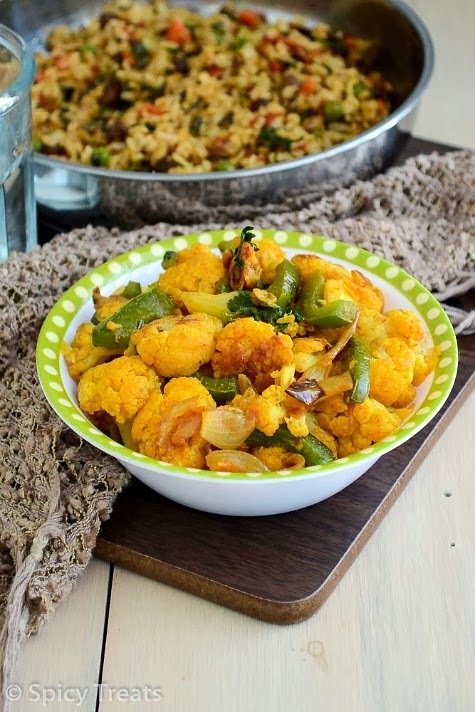 Cauliflower is one of my favorite vegetable and i love it any form, this stir fry, Gobi Mutter Gravy, Aloo Gobi Masala Rice or in fusion cooking like Tandoori Gobi Calzone. 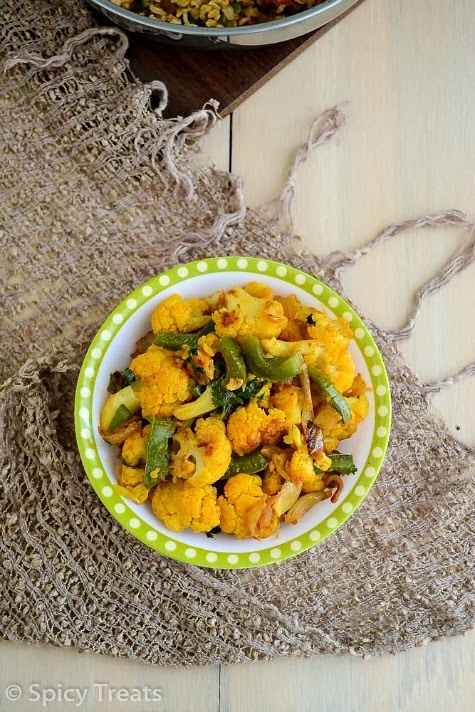 Cauliflower pairs well with potatoes, peas and also with capsicum. My family love these combo veggies. The below is the simple and easy to make stir fry with cauliflower & capsicum combo. 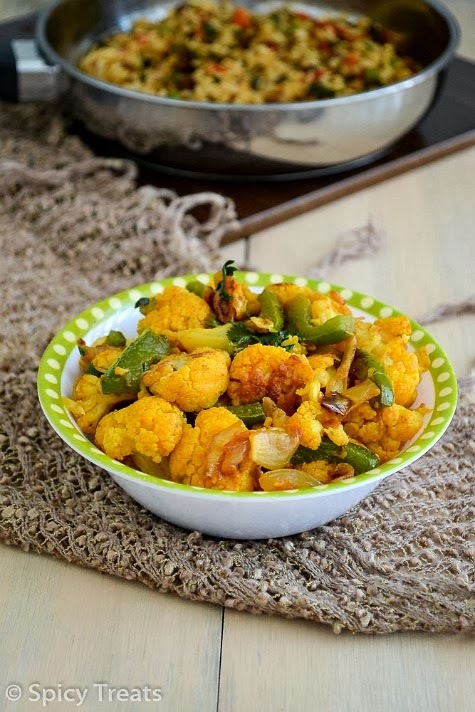 Bring 4-5 cups of water to boil, to the boiling water add cut cauliflower florets then wait for 3 minutes and drain florets, wash it in cold water and drain completely. Spread the florets in kitchen towel/paper towel wipe and use it in the recipe below. Now cook in low medium heat with occasional stirring. Do not cover the pan, because cauliflower will ooze more water and it become soggy . Fry it nicely without covering..it will take about 10-12 minutes only. Now the yummy fry is ready if u want add chopped coriander leaves and turn off the stove. Adding cauliflower florets in boiling water is optional but i like to do. 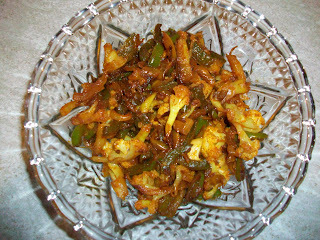 Have read it in web somewhere that its best to wash cauliflower in boiling salted water for few minutes and use it. So i prefer this method. Adjust chilli powder to your desired taste. the above one is a medium spice level. You can chop florets to desired size, inthe old picture i chopped into too small florets, so you will get thin crispy florets. Do not cover the pan while cooking, cook in medium high heat. thats a simple n yummy 1.. will try..